Andy Bloch made big news on Wednesday when he crushed a card in his hand during play in the H.O.R.S.E event after failing to get a new setup and drawing a 10-minute penalty in the process. In doing so, Bloch brought attention to an important issue that has plagued this year's World Series – complaints about the quality of decks being used and the presence of marked cards. Explaining the incident, Bloch noted, "The situation is going to be improved after today, but they didn't start the day with new cards and they should have in such a big tournament. One player found a card that had a mark. The dealer spread a new deck and there were a bunch of cards [in the new deck] that had marks on them too." Bloch's observation has been shared by many other players at the Rio, who have complained about the overwhelming presence of marked decks. One dealer, speaking on the condition of anonymity, noted, "The cards that we use in play are pretty cheap. They're very easy to mark accidentally when players peel the cards up to check their hole cards." While some players have been complaining adamantly about markings on decks, others insist it is a non-issue. Longtime poker veteran Mike Caro noted, "I have not noticed any marked decks, and I am usually very vigilant about looking for that. I have found them satisfactory so far. " Shawn Sheikhan agreed with Caro, saying "There's so much poker being played here, and the cards that they got are plastic cards [which are] not as good as kem cards, but these work as long as we get new setups here and there." As to why so many marked cards are present this year, there are many possible explanations floating around. 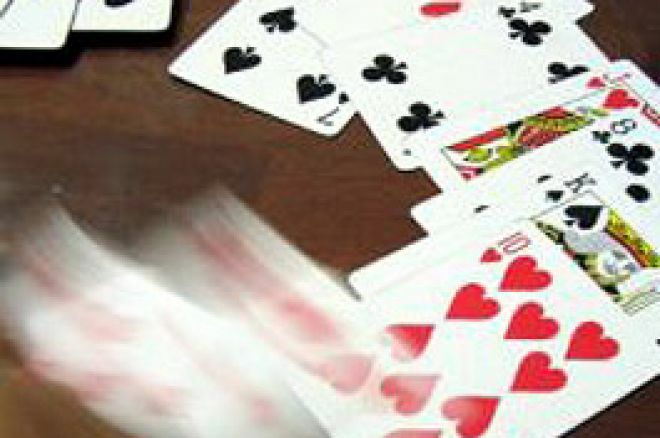 Some believe the cards are being marked to aid in lowball games, while others insist it is simply a result of players accidentally marking flimsy cards. Bloch, who believes the marks were made unintentionally, theorized, "It's just an artifact of how some players look at their cards - The nail will make a little nick in it." Mike Caro agreed that markings were accidental rather than the evidence of a cheat. He explained, "At this level of play, it would be almost unheard of [for intentionally marking cards] to happen because people would spot it at the tables and there are videotapes you can play back and see where the marks came into play. I don't see that happening here or in any of the big games because players protect each other." Caro added, "In a lowball game you want to mark high or low cards or sometimes in high/low games mark nine cards or medium cards, but that's just old time Rounders stuff and it doesn't happen in these arenas. I know it did happen a whole lot in old Gardena games 20 or 30 years ago and I've spent a long time fighting that, but the integrity of poker today is as high as it's ever been." Shawn Sheikhan, however, was a bit more skeptical. Noting that Razz was being played as part of the H.O.R.S.E event, he commented, "Playing a lot of poker the last 20 years or so, people say Razz is the easiest one to cheat at, so I wouldn't be surprised if that's the case, where people are making ridges on one end or the other, to try to mark the aces or deuces. That's one game where you always hear people say you might be getting cheated." When questioned about the standard of playing cards, WSOP Commissioner Jeffrey Pollack stated, "I hadn't heard anything about the cards being marked until today. I am looking into getting more fresh setups and I am definitely working on solving the problem." Whether the decks were being marked accidentally or as a form of cheating is up for discussion, but one thing is for certain – Andy Bloch is earning high praise among his fellow pros for moving to protect the integrity of the H.O.R.S.E event. Sheikhan noted, "I heard people cheering for him [when he got the penalty] because he was responsible for making the Rio put in new cards for everybody." Poker Pro Matt Matros added in his blog, "I've already experienced first-hand the cardboard cutouts that pass for official WSOP playing cards. To no one's surprise, my friend Andy Bloch is the one sticking up for the players, and he's already got himself a penalty for his efforts…Andy is a model for every poker player in that he is highly principled, highly motivated, and highly intelligent. When Andy sees something wrong in the poker world, he is more than happy to speak up, and he backs up his speech with actions." Editors Note: "Many" fresh setups were brought into the cardroom today, and this issue seems to be under control.